NASA's James Webb Space Telescope will use its infrared capabilities to study the "ocean worlds" of Jupiter's moon Europa and Saturn's moon Enceladus, adding to observations previously made by NASA's Galileo and Cassini orbiters. "We chose these two moons because of their potential to exhibit chemical signatures of astrobiological interest," said NASA astronomer Heidi Hammel. 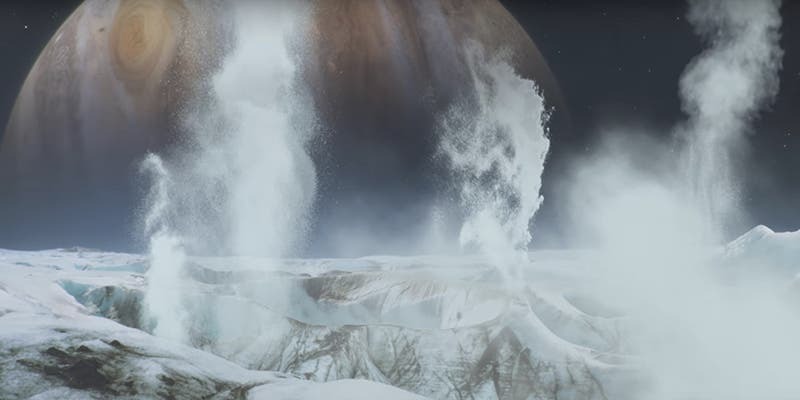 Of particular interest to the scientists are the plumes of water that breach the surface of Enceladus and Europa, and that contain a mixture of water vapor and simple organic chemicals. NASA's Cassini-Huygens and Galileo missions, and NASA's Hubble Space Telescope, previously gathered evidence that these jets are the result of geologic processes heating large subsurface oceans. This simulation shows possible spectroscopy results of Europa's water plumes, obtained using the Webb telescope's NIRSpec instrument.